CEO of Nansen Neuroscience Network. An organization that connects neuroscience and industry to speed up development of new diagnostics and treatments for Alzheimer’s, other dementia related illnesses, Parkinson, MS, and psychiatric illnesses. Master’s in Mgmt, Norwegian School of Mgmt; Exec. MBA in Strategy, Norwegian School of Economics and Business Admin. 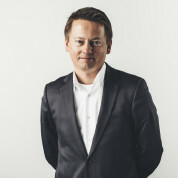 Formerly: Political Adviser, Conservative Party, Norwegian Parliament; External Affairs, Merck & Company; Director, Strategy, Southern Norway Regional Health Authority; headed national health practice, Ernst & Young Advisory, Norway; 2007-11, CEO, Oslo Cancer Cluster; 2011, Head, Healthcare and Life Sciences, Geelmuyden Kiese Group. Currently, Chief Communications Officer & Member, Mgmt Cttee, Akershus Univ. Hospital. Country Head, Table for Two, Norway. 2011-15, elected politician, Bærum municipality; Member of City Council and School Board, Conservative Party. Expertise: innovation, neuroscience, mental health, non-communicable disease. "An excellent teacher is more important than a prime minister."